Do you know what's included in your fiber cement cost or are you just hoping the contractor has all the bases covered? It can be very easy to get confused when contractors begin using unfamiliar units of measurement and architectural terms, but with a little bit of help, you can discover that it is really not that complicated. The language most siding contractors use is universal, and it doesn't really matter how old or what style your home might be--the terms should apply. Siding. Fiber cement is figured in units of measurement called squares. Each square is the amount of siding needed to cover 100 square feet of wall area. Moisture barrier. This is a material that should be applied to your home's exterior walls after your old siding is removed. It is available from several different manufacturers and in numerous sizes. Flashing. All windows and doors should be checked for proper waterproofing before your new fiber cement siding is installed. The flashing is normally a rubber membrane material at the sides and tops of each window and door, and there may also be metal at the tops. Even if your flashing appears to be okay, it does not hurt to take this opportunity to install new waterproofing. Prefinished. 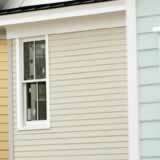 Fiber cement siding is available either unfinished or prefinished with a factory applied color. Unfinished costs less, but you'll have to prime and paint it. Fascia. Your home's fascia trim boards cover the ends of the roof trusses at the eaves. The soffit is below the fascia at the underside of the eaves, and your rake boards follow the roof pitch down at the gables to tie into the fascia. Many homeowners have their siding contractors cover their fascia and rake boards with aluminum, so they will be as low maintenance as their new siding. Knowing these terms should help you have a good understanding of what is included in your siding costs.